When brightly colored hair started to become a trend, I was happy, and with each new trend, I got a little happier. I love the rainbow hair and the glow-in-the-dark hair, and even parts of my hair that are pink. The more people with hair dyed fantastic colors, the better. Life is too short not to have fun with your hair. Unfortunately, not everybody agrees with me, and in fact, some people feel that having multi-colored hair isn't businesslike or professional. Not only do some employers disapprove of rainbow hair, but some parents and churches don't like it either. 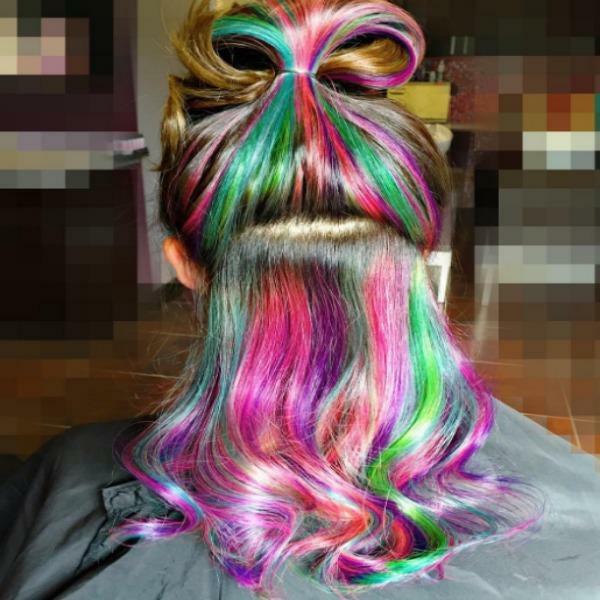 There can be so much backlash against rainbow hair that you might feel too intimidated to try it. 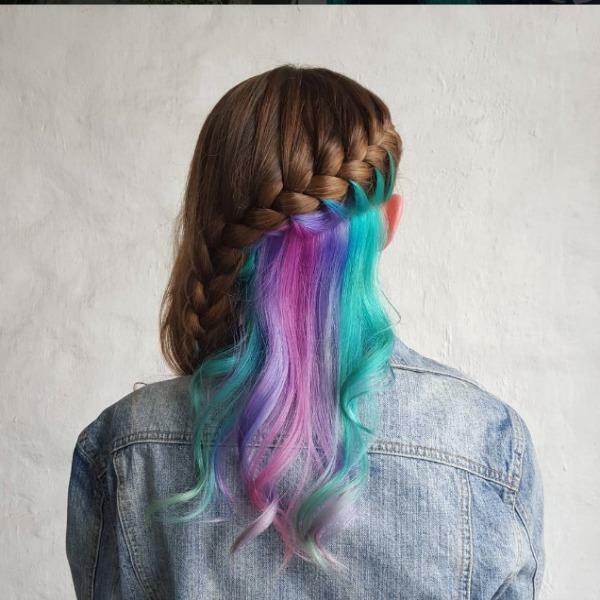 Luckily, there's a new hair trend that can help you out: hidden rainbow hair. 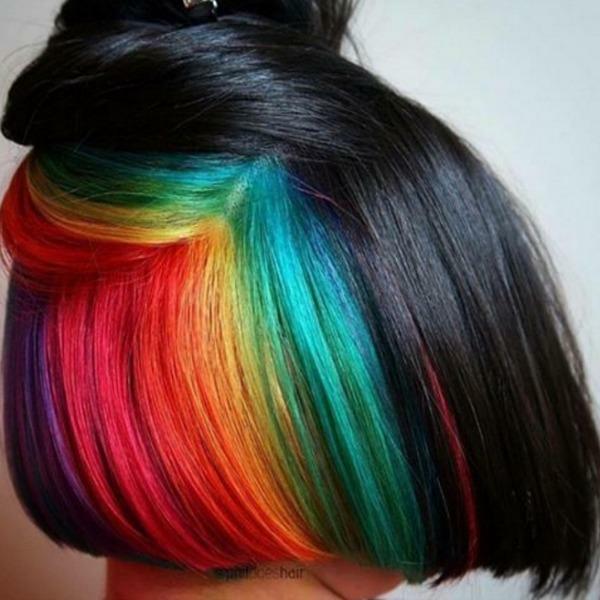 A vibrant rainbow of color is hidden under a curtain of a more natural shade of hair. 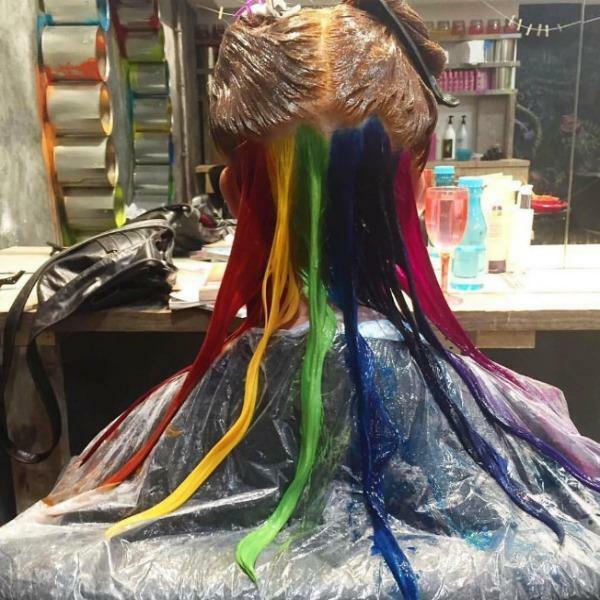 It was London's Not Another Salon that took rainbow hair to the next level, and that level is a covert one. No one has to know you have rainbow hair unless you want them to. The colors stay hidden under layers of normally colored hair until it's swept away to reveal it. 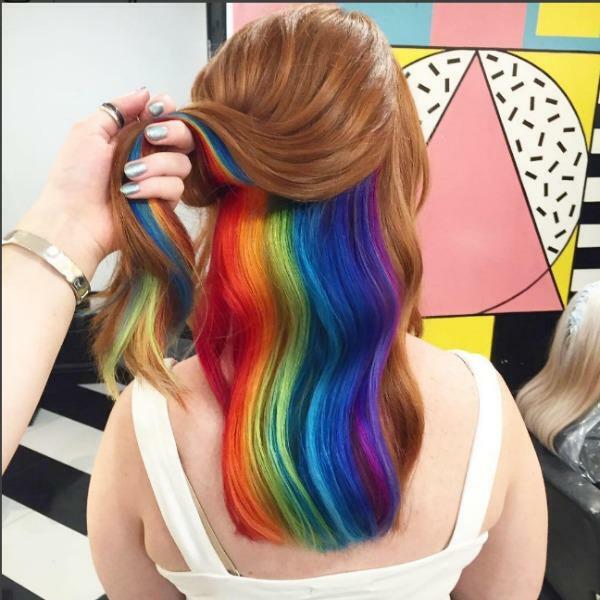 "Hidden rainbows are all the London rage right now," the salon said in an Instagram caption. London is often the scene of fun, young and colorful fashion trends. Hidden rainbow hair works well even with lighter hair. 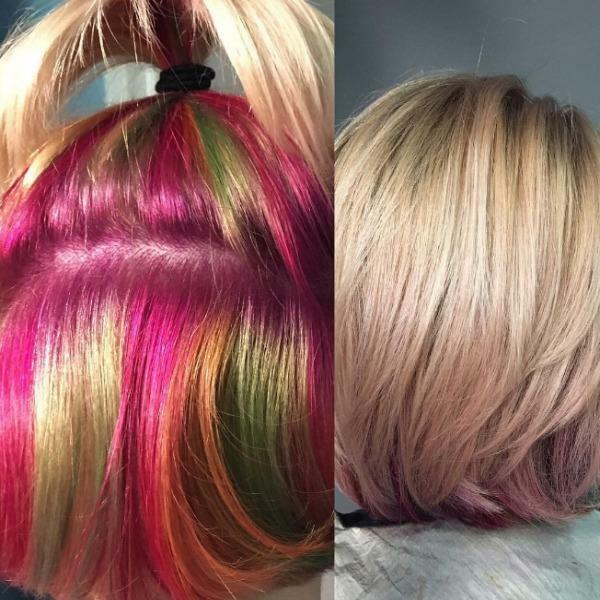 Hidden rainbow hair isn't a new idea; it's just that it takes a skilled colorist to achieve the look. The colorist must section of the model's hair and pin it up, leaving the bottom half to be split into different, vibrantly painted parts. Hair stylist Athena Golden told The Huffington Post, "Done wrong, the colors mix with the base tone of the hair and make a color not intended." The process of creating hidden rainbow hair must be done correctly to maintain the integrity of the hair. "Hidden rainbows are placed in spots not normally seen unless the hair is up," said Golden. You can experiment with coloring your hair vibrant, saturated colors and no one needs to know. You wouldn't know that there was a rainbow hidden underneath this hair. 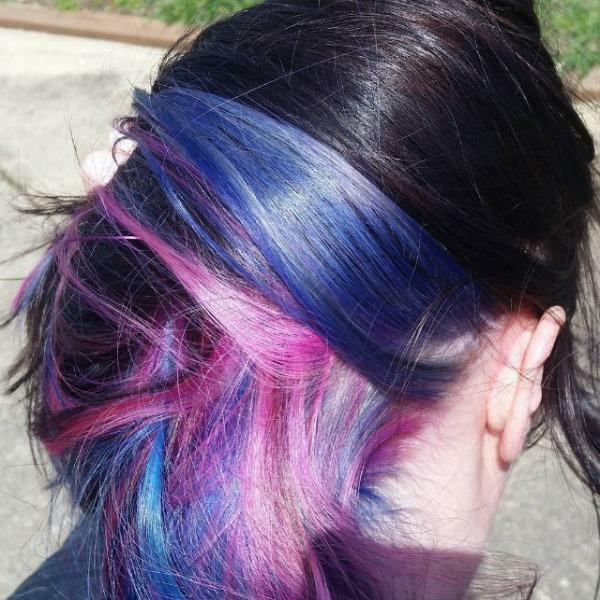 When hidden rainbow hair is done correctly, it looks cool without being in-your-face and makes a statement without being intense. It's especially fantastic when ithe hidden rainbow hair is styled into a braid or a topknot. 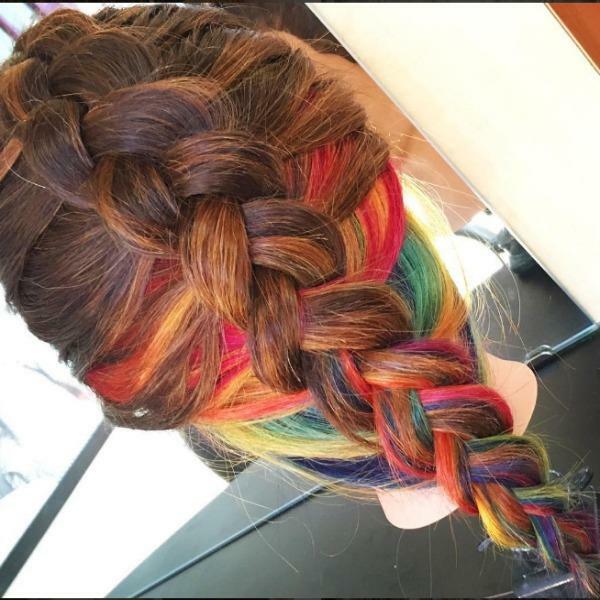 No one expects to see those pops of color in a braid. When you have hidden rainbow hair, you have a secret that you can share with the world or just keep it to yourself. It's the perfect accessory to any outfit. It's so versatile that it lets you be conservative or super-cool, depending on the need or your mood. All you need to do to go from business as usual to ready-to-party is sweep up your hair. One thing I can tell you from experience? The color will start to fade after a few washes. Just make sure to enjoy it while you can, because hidden rainbow hair, like many things, doesn't last forever. You don't have to choose whether to show your colors or hide them; you can do both at the same time. Whether you go for day-glow colors or pastels, this trend is guaranteed to get you noticed... as long as that's what you want.